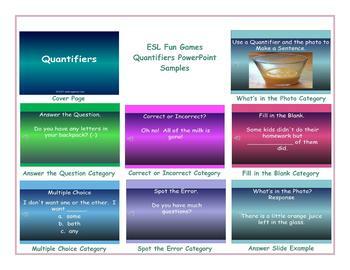 Try out our Quantifiers PowerPoint Presentation. Each Regular PowerPoint Slideshow has one topic with 6 task categories; What’s in the Photo? Answer the Question, True or False, Fill in the Blank, Multiple Choice and Spot the Error. Every PowerPoint Slideshow has a total of 60 different tasks with answers. All 120 slides are also animated with sounds! Open the slideshow in PowerPoint. Click the mouse or the right arrow button on your keyboard to advance to the next slide. To move back a slide, click the left arrow button. Students can take turns performing the tasks on the slides or present the slideshow to the entire class as a fun classroom activity or topic warmer.